Ancient Roman Theatre, built in the 2nd century AD. In 2015 site of executions by the ISIS terror regime. 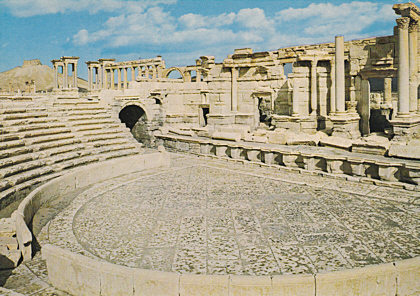 In December 2016 intentionally damaged by ISIS, partially destroying the scaenae frons and the proscenium area. 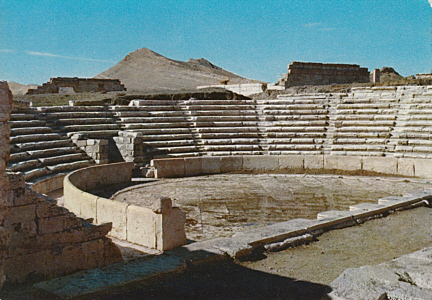 Reverse Text: "Palmyra - Théâtre. 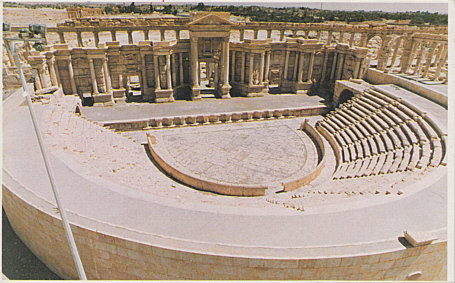 Palmyre - Theatre"
Reverse Text: "Palmyra (Syria), Palmyra (Syrie)"
Reverse Text: "Palmyra - Syria - The Palmyrian Theatre. It was used for wrestling ceremonies with wild animals. It has 13 sitting steps."